Ex-Pro Table top Tripod, Telescopic and compact – (80mm – 170mm) Perfect for Digital Camera’s for Product photography etc..
Mini table tripod 10cm – 15cm. 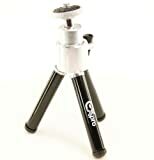 Three extendable legs (3 level) make this a steady base for cameras, LCD screens, microphones and mini speakers. This entry was posted in Discount Photography and tagged 10cm, 12.7cm, 15cm, Alpha, Aluminium, Black, Canon, Casio, Compact, Coolpix, Cybershot, Digimax, Easyshare, Exilim, ExPro, FinePix, Fuji, Kodak, Level, Lumix, Mini, More, Nikon, Olympus, Optio, Panasonic, Pentax, Samsung, Silver, Sony, suitable, Tabletop, Telescopic, Tripod by Ball Photo. Bookmark the permalink.